Paul Munro must leave Earth. He is sent to a station at the edge of the solar system, that is manned by just four people. There he must find out why certain signals are not reaching Earth. Why did I read this book: I’ll be honest – the first thing to catch my eye with this book was the cover. And then, when I read the synopsis, I was hooked. SO hooked, in fact, that I had to buy the book immediately from the UK (as it isn’t available in the US). In a not-so-distant future, mankind has changed. The majority of the human population is interlinked by the World Ear, an implant that allows its user to instantaneously connect with anyone else who is implanted, communicating in a mixture of images, sounds, and even transmitted sensations like touch, scent, or taste. The World Ear has allowed humanity to supersede the individual; it has allowed humanity to be connected in one massive consciousness, with information received and dispersed at the speed of thought. There is no need for speech. There is no need for strong emotion. The World Ear has taken humanity to its next evolutionary stage. WE is the story of Paul Munro, one man selected by the collective consciousness of the World Ear as a telemetry specialist on an important outpost at the furthest reach of the solar system, dedicated to analyze the gas planet, its moon, and search for any sign of intelligent life. But because of the unique problems posed by the planet and moon, none of the station’s inhabitants can be connected to the World Ear. Our first introduction to Paul is immediately after he awakens from the procedure that has disconnected him from the network – and his abject terror at being utterly alone, mute and almost completely incapable of communication. After his eight year journey (in stasis) to the outpost at the edge of the solar system, Paul gradually adjusts to new life with the three other humans that will likely be his only companions for the rest of his life – May (exuberant doctor), Lewis (imposing commander), and Vandamme (partner to the lost telemetrist and a self-contained astro-geologist) – learning to speak, emote, and interact. As Paul becomes more articulate and self-conscious, he suspects that there is something amiss in his mission to uncover the source of the interference with transmissions to Earth. With his suspicions mounting, Paul is determined to discover the truth at any cost. This is the first book I have read by John Dickinson, and what a fabulous introduction it turned out to be. WE is one hell of a novel. This is cerebral science fiction at its best, posing ambitious questions and demanding its characters and readers to confront what it truly means to be human. It is one of those books that gets better the longer one thinks about it; processing, digesting, and interpreting the data in every possible way (much like Paul’s “hunter” program). Ever since discovering Stephen Baxter last year, I have been on the lookout for hard science fiction titles that manage to blend human character appeal with the cold, cruelty of space – and WE manages to do just that. Reminiscent of Baxter’s Titan and of M.T. Anderson’s dystopian SF masterpiece, Feed, WE examines the meaning of humanity, the definition of intelligent life, and the value of the individual in relation to the whole. It is in these quiet questions, asked both explicitly by the characters, and implicitly of the readers, that WE shines. Is emancipation from “the We” (as the characters aboard the station call Earth and the World Ear) a good thing? At what level of connection does the individual begin to become irrelevant? The We is utilitarianism in the extreme, with a new overall consciousness comprised of ALL its interlinked consciousnesses – akin to a giant brain, with each human acting as a neuron, firing signals and interacting with others to produce the desired result. Instead of painting a dystopian future where consumerism runs amok (as in Anderson’s Feed), WE‘s future is more quietly menacing – our cult of personality and fixation on the individual falls to the greater good, which sounds fine, doesn’t it? Except in such a society, there is no individual autonomy – just as protagonist Paul is asked by Lewis, “Did you consent?” he is unable to answer. On a less-nebulous/more-concrete level, the reason why WE is able to provoke such intriguing questions is because the science, the setting, and the characters are impeccably written. From the technical aspects to the science (the space elevator, the limitations of the World Ear, the physiological changes to those in deep space, the temperature and atmosphere readings) Mr. Dickinson appears to have done his homework, working within the parameters of our current understanding of physics and our own solar system (see additional thoughts below for more on that). The images of a distant gas giant and its icy moon are richly – if coldly – detailed, providing a harsh, unforgiving, and evocative backdrop for the novel. On the character level, WE is told through Paul’s observations – effective, since Paul’s communication skills are underdeveloped to say the least, especially in his exchanges with his fellow crew members. In such an unrelenting, isolated environment, these character are a microcosm of humanity – Van, who turns to religion; May and Lewis, who cling to a different hope for the future; Paul, obstinate and determined to uncover the truth. As these characters say in the book, they are the last four humans in existence, differentiated from their siblings on Earth because of their disconnection from the We, their ability to feel acute emotion, and even physically with their low-gravity distorted bodies. It’s a scary and effective picture, with these fragile creatures struggling for life in the most inhospitable of locations. These characters are flawed, genuine creatures that make questionable decisions – and that is part of the beauty of WE. Ultimately, regardless of whether or not Paul and the crew made the right choices, they are able to make a choice, and that is the important thing. From a plotting perspective, I am loathe to say too much for fear of spoilers – suffice to say that WE is a psychological thriller, with a mystery and a powerful revelation. Though this is more of a quieter, slowly simmering plot, heavy on dialogue and internal reflection and lighter on action, WE may not appeal to everyone (this is no military science fiction novel, so if you are looking for nonstop battle scenes, look elsewhere). That isn’t to say the plotting is poor or the book cumbersome – because it’s not. I devoured WE in a single sitting. What else can I say? I loved this book. On a final note concerning the genre – WE is a young adult novel as much as, say, The Handmaiden’s Tale or 1984 or The Martian Chronicles (all books that are frequently shelved in the YA section, as well as the mainstream SF or Literature sections). Which is to say, WE doesn’t really fit into the typical, current mold of romance-featuring, adventure filled coming-of-age sort of novel that one might normally associate with YA F/SF (in fact, author John Dickinson has blogged about the mis-categorization of this book). That isn’t to say that WE shouldn’t be read by young adults – rather, it is a book that can transcend age barriers. Yes, neither the protagonist nor any other character in this book is a young adult, but need that be a defining quality for the genre? 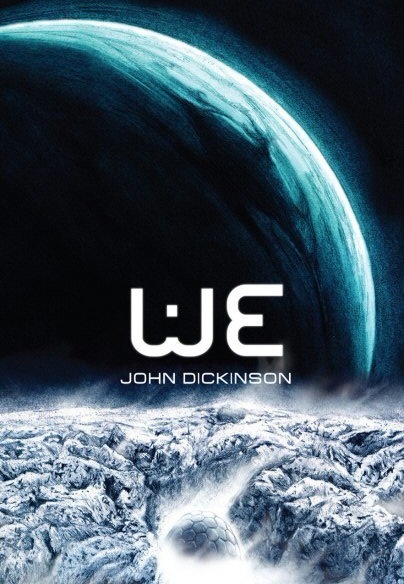 How about I put it like this: WE is a mainstream Science Fiction novel that I encourage anyone – of any age – to read. Rife with imposing, challenging questions, WE resonates as one of the best new science fiction titles I have had the pleasure of reading this year. He had asked to be alone when he woke. After all, he had reasoned, from now on he would always be alone. They had told him there would be no pain from the operation. He had looked up the techniques they would use, checked the possible complications and had understood why they had said that. Nevertheless, something in him was surprised to discover that they had been right. There was none. There was only emptiness. He blinked, automatically holding his eyelids closed for just that fraction of a second that would summon his displays. But no voice spoke in his head. No images appeared, no lists, nothing. There were no weather reports, news pictures, financial statements, alerts concerning the state of his house or vehicle or the transmission systems that he was supposed to maintain. There were no demands from his supervisors. And there were no personal messages. Like everyone else he always went to those first. But there were none – no loving images, no jokes or pictures, no one wishing him luck or promising to remember him. There was nothing more from Her. There never would be. You can read a full extract online HERE. Additional Thoughts: Though he never specifically mentions the name of the planet and moon, this all takes place on Neptune (a gaseous planet, furthest in our solar system) and its moon, Triton (I’m pointing this out because I’ve seen a few reviews call the planet Jupiter, probably because of the reference to a Great Dark Spot – which also happens to appear on Neptune) Since I am kind of an amateur astronomy dork (emphasis on amateur), here are a few cool things about Neptune, and its largest moon. 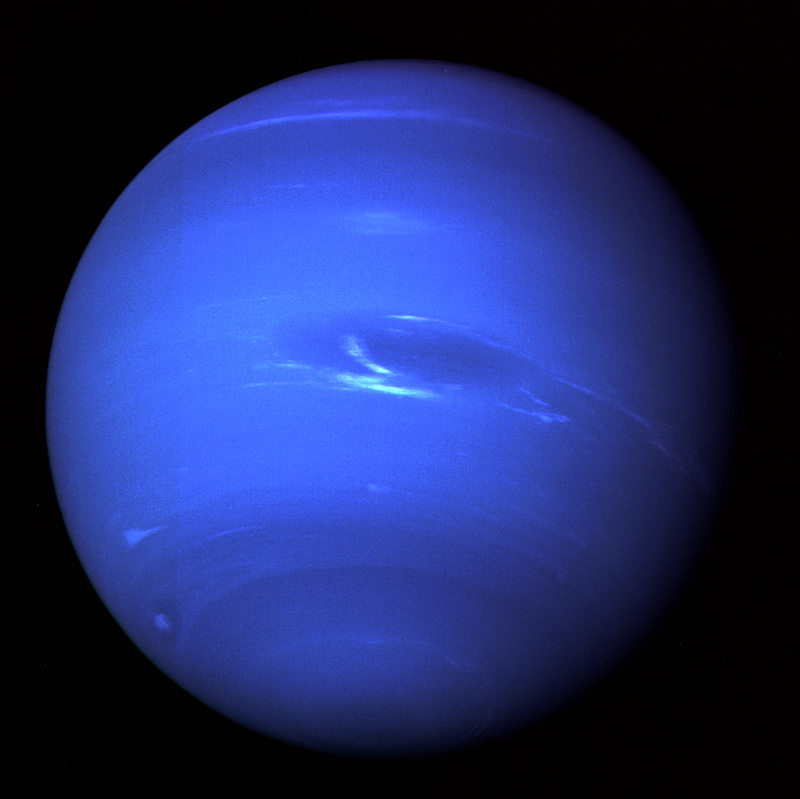 Like Uranus (though smaller) Neptune is a gaseous planet, composed primarily of hydrogen and helium, but as the most distant planet in our solar system and the coldest, it also has an abundance of ice – water, ammonia, and methane. Neptune has thirteen moons, the largest of which is Triton (the moon on which WE‘s space station is built). Now the COOL thing about Triton is that it is one of the few moons in our solar system (and the only large moon) that has a retrograde orbit – that is, it orbits Neptune in the opposite direction of the planet’s rotation. 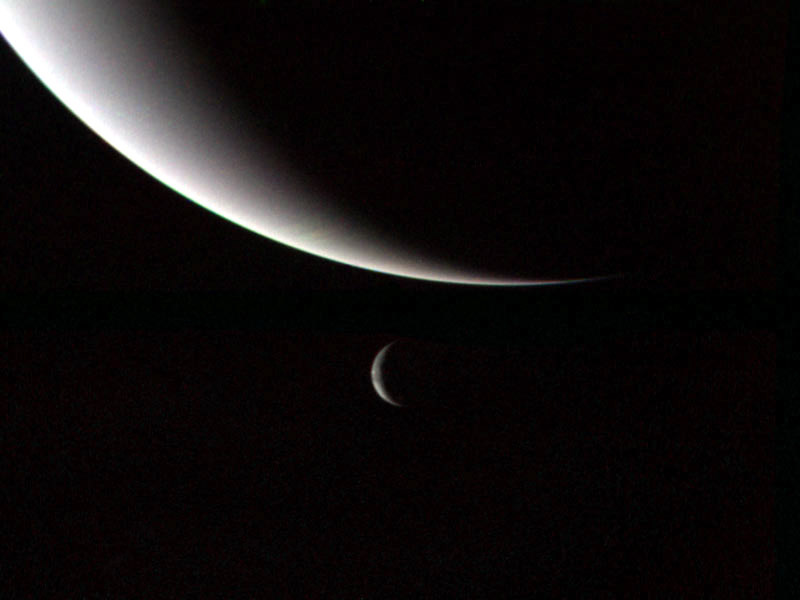 And, like our moon, Triton has a synchronous rotation with Neptune – one side faces Neptune at all times. 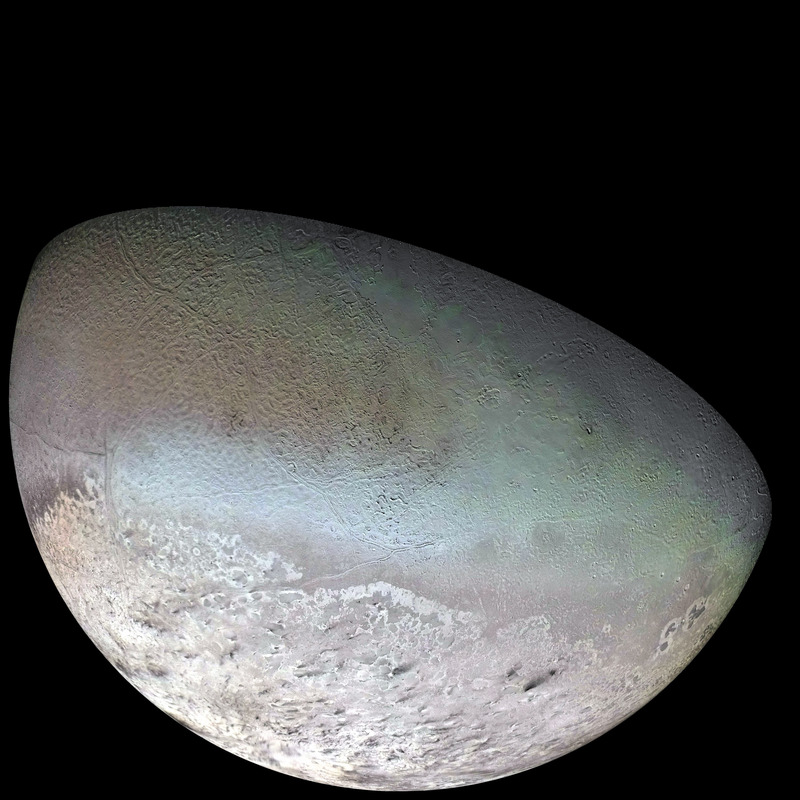 The other cool thing about Triton is that because it has a weirdo tilt, both of its poles take turns facing the Sun – which in turn means, Triton is geologically active (i.e. the moon has volcanic activity and active nitrogen geysers, caused by heating from the Sun). Triton also is one of the coldest objects in our solar system, with surface temperature readings of -235°C (-391°F). (Intriguingly, Neptune itself is frigidly cold, but at its liquid mantle core reaches 5000 Kelvin) The observations we have of Neptune and Triton are from Voyager 2, the only spacecraft to fly by the planet and its moon in 1989. You can read more about Neptune and its moons on NASA’s Solar System Exploration page HERE. Rating: 9 – Damn Near Perfection, and one of my favorite novels of 2010 so far. If you haven’t already, you should try “Feed” by M.T. Anderson. It had a similar devise to the World Ear called The Feed and is YA. It’s more about what happens when you loose your connection – or the connection starts to break then about it being taken from you. It also deals a lot with how teens interact and behave when life gets really difficult. It was really well put together and demanded a lot of me as a reader. It made me think and I thoroughly enjoyed it. Casey – Thanks for the rec! I actually have read FEED (and loved it), and linked to my review of FEED in my review above. (I know, it’s long and buried beneath the rambling 😉 But yes, it’s a very similar conceit, although WE is less of that consumerism dystopia and more of a psychological thriller with some stirring questions about human nature. I’d definitely give WE a shot if you liked FEED, too. Danielle – So, you’ve read Dickinson’s other stuff! Awesome! I’m definitely going to have to check out his backlist. it’s interesting how a lot of books are getting pegged as YA when they fit better into other categories (not that i dislike YA; in fact, i like it and read it a lot). i can’t help but wonder if it’s because YA is so popular lately, and some publishers are desperate for sales. whatever the case, this looks like a really intriguing book! At first I thought this was some sort of re-boot of the famous Russian novel ‘We’ by Zamyatin. Phew! I’ve just come off of reading books from the classic speculative fiction era (60s & 70s, around there) and I was really lamenting the lack of modern sci-fi novels that I could get into. I mean, something melancholy and thoughtful that makes me think about something differently. This sounds so perfect, I want to kiss you for reviewing it and bringing it to my attention! Great review ! I’m sure to read the book. I agree with Jordan : something in the comment made me think of the SF books from the 70s. Me too! This sounds like a great book. I had to go confirm by Googling before I posted this, but for anyone interested, John Dickinson in Peter Dickinson’s son. (And Robin McKinley’s step son). So there is lots of good reading material available from that family, that’s for sure! I haven’t read anything by him yet, but due to this review, I’m definitely going to try his books! Hey – did io9 let you guys know they cross-posted you? Hello Friend Thanks for the information. I am so excited that I have a copy of this book. I have been meaning to read it for a couple of months. It has been sitting on my bedside. To be honest, until I read this review I had no idea what it was about but I was captivated by the cover. I love the sound of the World Ear. This book sounds conceptually fascinating.